Man, these three magnets are soooo pretty! I doubt they do the actual course justice, but they're a start. Thank you so much for my magnets, Erin! I love 'em! The final leg in our holy roller at Augusta is Hole 13, Par 5, 510 yards. This one's called the Azalea, a signature shrub of Augusta - indeed, several varieties line the entire left side of 13 from tee to green. This hole would definitely be my mom's favorite place to hang out, as evidenced by the quarter-mile of azaleas she once planted along our driveway. Of course, I look to the history of the course to tell me why there's a huge emphasis on horticulture here. From what I gather, it's mainly because the 365 acres they built the course on was filled with the natural architecture of a golf course, but also some trees and shrubs that had been there since as early as the Civil War, when it was owned by Fruitland Nurseries. After reading some of these older articles though, I have to say I wish I'd kept the Masters on my DVR. I'd love to go back and watch, not for the golfers, though Phil Mickelson pulled off some miracles in his pursuit of the green jacket this weekend, I know. But I'd love to go back and match up the holes to the flowers. Whoa. Now that's me, channeling my mom. Well, look at that. @cnnbrk and @PGATOUR should take a hint. 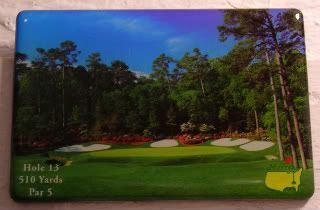 With the exception of this eta, I just magnetblogged three magnets about the Masters - without talking about Tiger! It can be done! Even from Amen Corner!